"Unprecedented" is a word we all look forward to use now and again. It denotes, essentially, success at one’s work, the culmination of an effort to better something that was not thought it could be achieved at first. TemaHome, like previously discussed here, has worked hard to become the first globally recognized Portuguese brand in its field, and in reality, our name is significantly more acknowledged internationally by competitors, clients and the media than we reckoned before. Our media exposure this year is definitely deserving of the term “unprecedented”, although last year we averaged one piece of news per day bearing the TemaHome brand (essentially in Portugal). 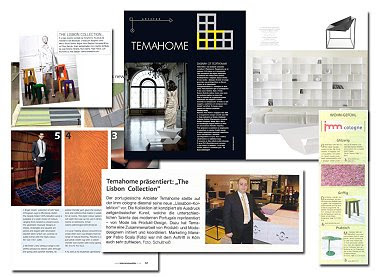 Up until the build-up to the Salone in Milan last month, we had gathered a very positive number of articles featuring TemaHome, reaching as far and diverse countries as Sweden, Poland, Bulgaria, Russia, China and many others in Europe and the USA. Some articles were not even witnessed by us, rather being recounted to us by clients all over the world. Interesting to note is that personal and specialized blogs are now also inside the scope of any company willing to gauge its popularity towards the general public. This new type of media, too, has been a successful channel of divulgation for Temahome, through its authors and representatives. For Portuguese furniture designers, this is unprecedented as well. The basic guideline for us to get where we are at present has always been serious work and dedication on how we present our products as Portuguese-made, high quality creations. These are the fundamental factors with which we can be granted respect from the international design community, traditionally very skeptical and demanding, due to its specialized knowledge of the inner workings of its market. For that reason, we will always try to set our own tone, rather than follow others. There are, undoubtedly, aspects to be improved, and our creative team has been meeting constantly to determine what awaits in 2010. New products, extensive participation in worldwide events, partnerships with global entities, more interactivity online; this is all part of our day-to-day conversations. It is these achievements, big or small, and your support, that keep us motivated.